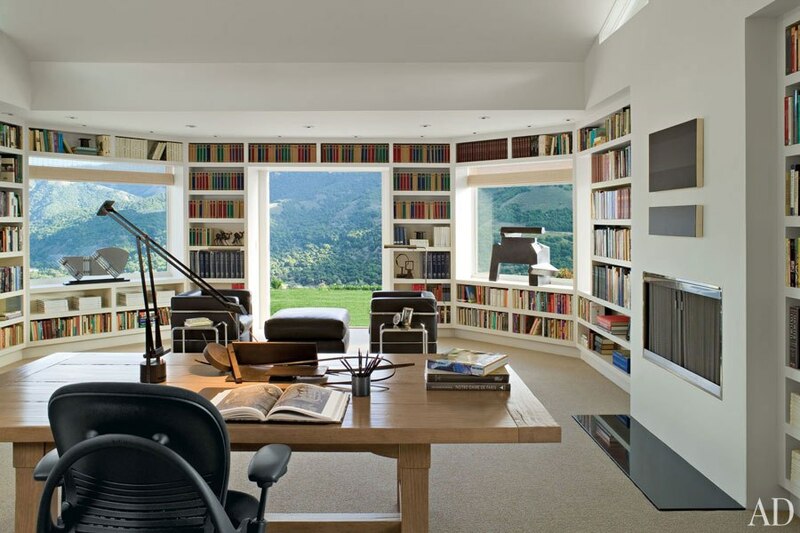 Ooh, two of my favorite things — bookcase walls and mountains! I usually like your library list photos but this one is wow! Oh yes, this one! I want this room, with a fire crackling away in the fireplace (probably a gas log). Perfect! This library has everything, Claire; books, more books, a view, comfy chairs, a fireplace. Sigh. I find the library too be a bit on the sterile side, but that view! It’s like a scene from The Sound of Music! Wow, those views! But seriously, how could you sit and read with all that right outside the windows? I’d need to be getting out there! Doesn’t hurt to have all the beautiful scenery outside those lovely huge windows! Just gorgeous. Not a particularly comfortable room, but it’s more office than comfy library, and the views from the windows are just stunning. It is a beautiful, functional room. Oh my that’s gorgeous! I’m afraid I’d spend all my time looking out the windows at the view instead of paying attention to what’s on my desk! Am I the only person who finds this room scary? Much too neat and clean and tidy. And too much white., and big expanses of glass always make me uneasy… I wouldn’t dare do anything in a room like this in case I disturbed it!